Oh my goodness! There is just so much to say about this bag that we have a whole post dedicated to it! The Dahon Speed D7 is fitted with this Altura rack bag mounted to a Dahon ARC Rack. I give it high marks for being easily attached and detached. The strap extends to sling around your shoulder, which is handy for shopping and filling up with heavy cans of chili beans. I’m considering adding a pair of Altura Dryline panniers for longer touring, though that may require changing over to a larger touring rack so that my heels don’t bump into them when pedaling. 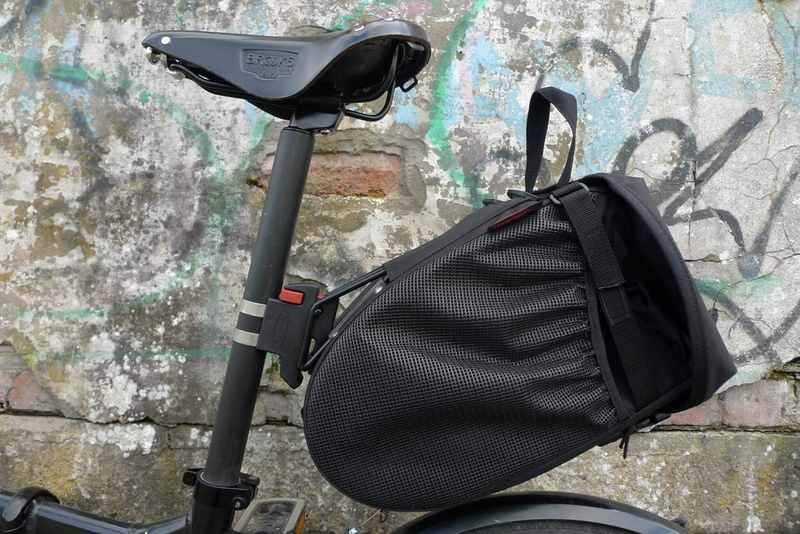 The Dahon Vitesse is fitted with a stylish Brooks B17 saddle. The Dahon D7 Speed is fitted with a cheap Bell GelTech Seat from ASDA. After trying a couple of different seats, including the original Dahon seat and a Bioflex Gel Sprite, this one is the only seat I can ride for miles on end without getting the least bit sore. Both the Dahon Vitesse and the Dahon D7 Speed are fitted with Aber Hallo Stem extensions. They’re the only extensions we’ve found that work in conjunction with the Dahon handlebar clamp. They’re typically used to extend the handlebars further away, for mountain biking, though can be used to bring the handlebars closer so you can sit more upright. At least that’s what we both use them for. This cheap Bell bike basket came from ASDA and has been both a blessing and a curse. Mounting things directly to the handlebars makes it really difficult to steer, and when I park the bike, it almost always falls over unless I remove the basket. Luckily it slides off and removes quickly and I’ve used the mounting attachment just as often as the basket, for holding my tiny messenger bag. I’m not sure they make them this way anymore, as what I seem to see in the store now are ones with clip attachments. One of these days I may splurge on a Dahon luggage truss and basket, but for now, this will do. The Dahon Vitesse is fitted with a set of Schwalbe Big Apple tyres. These chunky tyres not only absorb vibration, but also add stability and are by far my best upgrade. They look pretty good too! The Dahon Speed D7 is fitted with a set of Schwalbe Marathons. I was worried that the Big Apple tyres wouldn’t fit with the mudguards, which it turns out they do, but I’m happy with these anyway, as they have a bit more tread. This tiny little light was a Christmas gift, and is absolutely awesome! It’s easily attached to the rear post and has two little beady red eyes that are extremely bright. Not only do they help you be visible to traffic, but I think they also help to ward off evil spirits. This little bike computer records individual trip distances and times, as well as overall distance, and has a clock. The installation instructions were extremely minimalistic, like many things designed in Germany. It was tricky to figure out how to calibrate it with my tyre size, etc, but once I had it all figured out, it worked pretty good and detaches quickly and easily. Knock on wood, we’ve only had to use one of the hex wrenches in this set. It was dirt cheap from ASDA and comes with different hex, spoke and some other good-for-nothing wrenches, screwdrivers and inner tube repair patches and levers. This lock was pretty cheap and fits easily with the post quick-release attachment. It’s really easy to whip it on and off, though there’s no cover on the lock to protect it from the elements, which means you may have to spray it a bit from time to time.